There are a lot of different ways to maximize the amounts that you put into investing in a 401k retirement plan each year. If you don’t earn a lot and you can get anywhere near the maximum contribution limit, you should make it your mission to put a certain percentage into your retirement savings account each paycheck. Once you get a bonus, raise or promotion, the amount that you contribute will go up without you even realizing it’s happening. There are even some plans out there that automatically increase the percentage of your contribution every year. To make the most of it, you should increase the percentage of your contributions by at least one percent each year until your reach 15. Investing in a 401k retirement plan won’t ever be a bad idea. · If You Get A Free Consultation With An Advisor, Take Advantage Of It! You definitely don’t want to pass up a chance to get detailed, customized advice from a financial advisor. If your savings plan allows for it, you should definitely schedule your free consultation. Use that opportunity to get burning questions answered and learn more about the options you have at your disposal. Once you enroll in the 401k plan, you’ll get the opportunity to choose how you want to invest your money. There’s quite a few options to choose from too! The major brokerages like Fidelity, Vanguard and Merrill Lynch are the most common providers of employee 401k plans and they have seemingly endless resources like online assessment that will help you decide which ways to best invest your funds. With information like your age and risk tolerance, they can create a portfolio that will highlight the best options for you to choose as far as investments go. As a general rule of thumb, the younger you are or the higher your risk tolerance, the more stock funds you should have under your belt. If you’re older and have less risk tolerance, you should invest more so in bond and money market funds. You’ll definitely encounter a higher ratio of upsides when it comes to investing in a 401k retirement plan, but there are a few downsides to consider before you decide to open up your account. They’re not huge factors, but they will certainly matter to at least a handful of individuals. 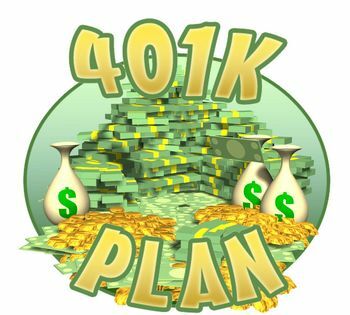 · Your Stock Options Are Limited When It Comes a 401k. With an IRA or brokerage account, you have all kinds of stock options out there to explore. If you’re trying to find more interesting investment options, you’ll probably be disappointed at the ones you can choose from when you start investing in a 401k retirement plan. At most, you’ll have the basic options–stocks, bonds and cash–at your disposal and that’s it. The good things about this comes in if you’re less experienced when it comes to investing. Having a limited array of stock investment options makes things simpler and easier to handle. The account fees really rack up quickly. The administrative requirements of a 401k cause it to be an expensive venture. As a participant of the program, you have very little say or control over the services you receive. These services are directly related to fees you’re made to pay. If you want to keep your fees as low as possible, you should go for exchange-traded funds or low-cost index funds when you can. · Making Early Withdrawals Will Definitely Cost You. One of the biggest downsides to investing in a 401k retirement plan is the fact that you’ll be penalized in a big way for making withdrawals before you reach the age of 59½. On most occasions, you can only withdraw money from your 401k account if you’re facing deep financial strife. Even still, you’ll be forced to pay a 10% penalty. It’s designed to stop you from taking from the account like most people would be tempted to do otherwise. This will help ensure that you have the money you need to make it comfortably through your retirement years. Investing in a 401k retirement plan is an important part of planning for your life after work. Nothing is worse than working hard your entire life only to have zilch to show for it when you need help. If your employer does provide 401k plans, you don’t want to miss the opportunity to start saving as early as possible. You won’t lose any money if you’re fired or you move on and your assets are protected by federal law, so there’s virtually no worries at all. The good things about investing in a 401k retirement plan heavily outweigh the bad things and you won’t regret taking the leap. Go for it: get all of the free money you can from your provider, meet up with a financial advisor if you’re awarded that free perk and watch your savings account grow to wild numbers!